LACUS Day on February 28, 2019 - please sign up! Water is often called a complex liquid because of the directionality of the hydrogen-bonds individual water molecules can form among each other. It is generally accepted that these hydrogen bonds are responsible for the many peculiar properties of water, such as the density maximum at 4°C. The quest on the structure of water, and how it is modified in the vicinity of solutes and interfaces, has been highlighted as one of the 125 most pressing problems of science in the 125 anniversary edition of the Science magazine . For example, it is known since decades from macroscopic, thermodynamic observations that the entropic contribution of water is a crucial factor to the stability of proteins, which lead to the term “icebergs” for solvation water . Recent THz experiments were interpreted by a solvation shell of a protein that extends 1 nm into the bulk . However, from neutron scattering it is clear that these icebergs cannot be taken literally, i.e., no crystalline structure is observed in the vicinity of a protein. Nevertheless, the observation of an entropic decrease of solvation water remains, but as of yet it is completely unresolved what this implies structurally. There is not even agreement on the structure of bulk water. Recent x-ray absorption experiments were explained by each water molecule being only two-fold coordinated  and small angle x-ray scattering experiments were explained by domain formation over 1 nm length scales . In the deeply supercooled regime (so-called “no-mans land”), it is suspected that water undergoes a liquid-to-liquid phase transition, whose reminiscence stretches into the room temperature regime and is at the basis of the peculiar thermodynamic properties of water . All these results [3-6] are highly controversial and by no means generally accepted. The high complexity of the water problem is to be contrasted to the very simple computer models (e.g. SPC or TIP4p water), which seem to describe many of the macroscopic (thermodynamic) properties of water reasonably well. It is not clear whether this agreement is obtained because these models describe water correctly on the microscopic level, or whether it is the result of just smart fitting that results in the correct macroscopic behaviour for the wrong physical reason. In any case, water for sure is not a solvent that just provides some friction, but the directionality of hydrogen-bonding makes it an integral part to the structure-function relationship of bio-macromolecules. To the extent we understand a protein as a structured surface, it is clear that similar effects are relevant also at other surfaces and are important for example for the light-driven electron transfer processes at electrodes. The dynamics of bulk water has been studied extensively using ultrafast infrared spectroscopy, in particular 2D-IR and 3D-IR spectroscopy [7-11]. These studies concentrate on the OH-stretch vibration of the individual water molecules and make use of the fact that its vibrational frequency is a relatively sensitive probe of the strength of hydrogen bonding of a given OH group to its environment. As such, the OH stretch vibration serves as local probe used to interrogate the intermolecular degrees of freedom of water. From these experiments it is known that the memory time of water at room temperatures, i.e. the typical time a given water molecule stays in its hydrogen bond environment, is a few picoseconds at most. 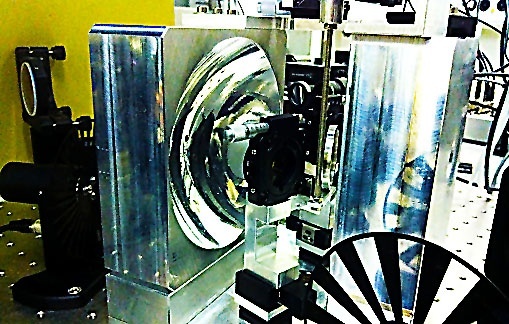 However, these experiments are indirect because they take the detour of the OH stretch vibration (which is complicated by itself) to learn about the structure of water. It would be desirable to measure the intermolecular degrees of freedoms of water directly such as the vibration of a hydrogen bond. These types of modes appear in the far-IR spectrum (<600 cm 1), which is attractive because these modes are thermally excited, as such make the action, while quantum mechanics dictates that an OH vibration as a high-frequency mode is completely frozen at room temperature. Conventional (1D) spectroscopy in this low-frequency regime has been performed since decades using both Raman and far-IR (THZ) absorption spectroscopy. Unfortunately, the desired information is hidden in very broad and unstructured bands in these 1D spectra. A multidimensional spectroscopy directly in this frequency range has the potential to “look underneath” the broad band and better resolve it. Both 2D-Raman  and 2D-THz  have been proposed and explored, but for various reasons, none of them can currently tackle the water problem. In recent works [14, 15], we have therefore proposed a hybrid method, 2D-Raman-THz spectroscopy, that circumvents many of the problems of pure 2D-Raman or 2D-THz. 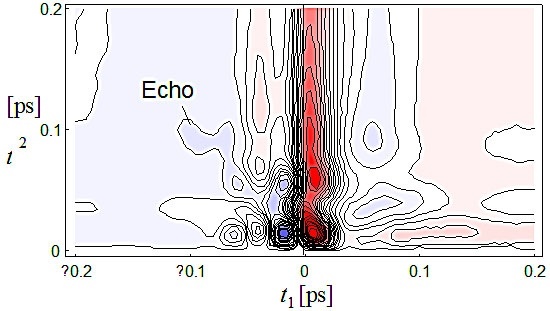 In a theoretical work based on molecular dynamics simulations, we have investigated the information content of this new spectroscopy and have shown that one may be able to observe an echo directly in the low frequency regime (see Fig. 1). Echo’s are a hallmark in multidimensional (i.e., multi-pulse) spectroscopy  and my hint towards heterogeneous structures in water. We are currently working on an experimental realisation of the technique (Fig. 2). In preliminary experiments we could show that the 2D-Raman-THz signal is small but readily measurable. Searching for such an echo in the experimental data will be a major task of this project.